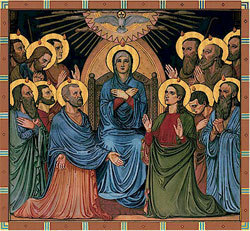 Pentecost was one of the three great Jewish feasts of the year and in the Christian calendar this Day also ranks as a pivotal moment as the birth of the Church. If we say that the Sacraments were born at the moment when the side of Christ was opened on the Cross, then on Pentecost Day the Apostles were sent by the Holy Spirit out into the world. The early manifestations of the Holy Spirit were very dramatic; but nowadays the action of the Spirit is no-less-evident. With the eyes of faith we can see the wonder that God works throughout the Church: conversions brought about, holiness lived-out in daily life, new Saints…all these are manifestations of how God is still working the wonders first wrought when the Church emerged from the Upper Room on this Day. Pentecost is not an isolated incident in the life of the Church. ; the Holy Spirit is ever-active. Whenever we pray, receive a Sacrament, perform any act of goodness for the love of God, the Holy Spirit is the One who inspires us. This week I welcomed our bishop-elect, fr Alan Williams, to the Parish. He came for an informal meeting with me in which I was able to thank him for accepting to be our Shepherd here in Brentwood Diocese. I assured him of our continued prayers and I asked him to keep this particular Parish Family in his own prayer. To be a Bishop in the Church is to undertake the threefold mission of Christ - Priest, Prophet and King - which is to make holy God’s People, teach the Catholic Faith and govern a portion of the Church. On this Day of Pentecost, let us ask the Holy Spirit to guide us along the paths of renewal. We also ask Our Lady of Walsingham to watch over us, our Diocese and our Bishop-elect.